It took Richard Nixon almost five years to launch a Saturday Night Massacre. Donald Trump launched a Monday Night Massacre in just ten days. Richard Nixon was a miserable excuse for a president who appears credible only by comparison with several of his more miserable successors. But, as bad as Nixon was, it took the former president the better part of five years to get into a fight with the Department of Justice and fire a top lawyer for following the rule of law rather than the dictates of an out-of-control and unconscionable White House. It took Donald Trump ten days. Dean hailed Yates for standing up to Trump, as did Congressman Elijah Cummings, the ranking Democrat on the House Oversight Committee. My responsibility is to ensure that the position of the Department of Justice is not only legally defensible, but is informed by our best view of what the law is after consideration of all the facts. In addition, I am responsible for ensuring that the positions we take in court remain consistent with this institution’s solemn obligation to always seek justice and stand for what is right. At present, I am not convinced that the defense of the Executive Order is consistent with these responsibilities nor am I convinced that the Executive Order is lawful. 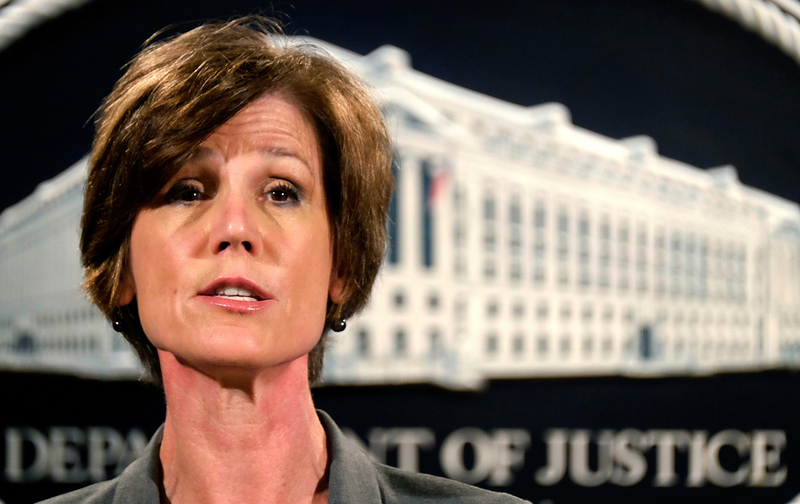 Yates had to have expected that she would be dismissed by a president who does not take kindly to official resistance—especially when it upsets his political calculations. But she may have been surprised by the speed with which Trump moved. Tonight, President Trump relieved Ms. Yates of her duties and subsequently named Dana Boente, US Attorney for the Eastern District of Virginia, to serve as acting attorney general until Senator Jeff Sessions is finally confirmed by the Senate, where he is being wrongly held up by Democrat senators for strictly political reasons. Boente’s role will be temporary. Trump has nominated Sessions for attorney general, and that nomination is advancing in a Republican-controlled Senate. Sessions, who has faced overwhelming opposition from civil-rights groups and civil libertarians, will face new questions—similar to those he once asked Yates—about whether he intends to serve the rule of law or simply do the bidding of a president with whom he has so clearly aligned himself. Foes of the Sessions nomination are still hopeful that a handful of Republican senators might join Democrats in determining that those questions are so consequential that the senator’s nomination cannot go forward. But, so far, there have been few Republican acts of conscience in debates over Trump nominees. No matter what happens with Sessions, however, the turmoil will continue. There are still pundits and politicians who resist the use of such stark language. It is a troublesome acknowledgement that many are not yet prepared to make. But Trump’s “Monday Night Massacre” highlights concerns expressed by the ACLU. And the administration’s response to federal-court rulings that blocked parts of Trump’s scheme—a combative and confusing declaration that “Saturday’s ruling does not undercut the President’s executive order.… The order remains in place…”—confirmed the legitimacy of those concerns. There is a strong argument to be made that, when Donald Trump assumed the presidency, we entered a #ConstitutionalCrisis moment. And it is unlikely that this moment will pass any more quickly than did the crisis period that extended from Richard Nixon’s lawlessness.